TULSA, Okla. — No. 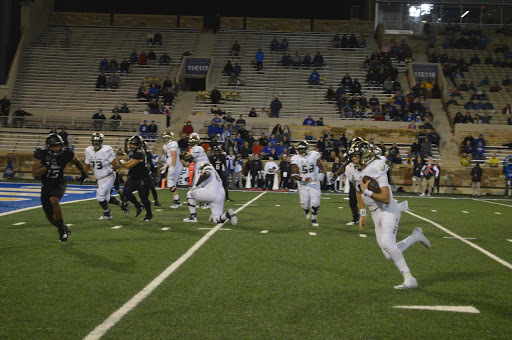 21 USF football defeated Tulsa 25-24 on Friday thanks to a last-second 22-yard field goal by Coby Weiss. Here are some takeaways from the Bulls’ sixth win of the season. The Bulls never led in the game until after Weiss’ field goal, when two seconds were left on the clock. Tulsa isn’t the kind of team that it should take a walk-off victory to defeat. True, the Golden Hurricane have competed well against quality teams such as Houston and No. 7 Texas. But, that’s in the past and, as far as Friday went, Tulsa quarterback Seth Boomer was awful. He completed only six of his 21 passes for 79 yards. Yet, somehow, Boomer and the Golden Hurricane were moments away from upsetting the Bulls due to USF’s inability to do anything on offense for the majority of the night. Jordan Cronkrite broke free for another explosive rushing touchdown during the third quarter. Cronkrite recorded his fourth straight 100-yard rushing game with his 151 yards. His performance gives him 757 rushing yards on the season with six games remaining, meaning, barring injury or catastrophic regression, he is well on his way to USF’s ninth 1,000-rushing-yard season in program history. And, to think, running back was one of the concerns going into this season for USF. Probably is the key word here. USF probably shouldn’t have been ranked last week either, but several teams toward the bottom of the Top 25 lost last weekend, which opened up slots for the Bulls. Another weekend of craziness in the Top 25 surely helped USF, which actually moved up two spots Sunday. But the reality is, taken in a vacuum independent from upsets as high up the poll as then-No. 2 Georgia, USF didn’t play well enough to warrant staying in the poll on its own merit. A team that needed a last-second field goal to win against a team that has zero wins against FBS opponents should not be ranked in any Top 25 poll, especially if it had been toward the bottom of the poll to begin with. UConn is bad — historically bad. It’s last in FBS in S&P+, which is an advanced statistic that is more predictive than anything — but it’s still not something you’d want to be 130th in. Some commentators have said the Huskies may have the worst defense since World War I. Others say World War II, which is probably not that much better. A mammoth victory won’t completely take the sour taste out of the mouth of USF fans after Friday night, but it’ll go a long way in helping. Saturday’s game opened with USF as a 29.5-point favorite.